For the hollandaise, put the vinegar, water, bay leaf and peppercorns into a pan and simmer gently until reduced to about 1 tbsp, strain and add 1 tbsp water to it. Whisk in the yolks and vanilla. Place the bowl over a pan of barely simmering water. Add a knob of butter, whisking until melted and the mixture has thickened slightly. Gradually add the remaining 150g butter a cube at a time, whisking after each addition until all incorporated. Cook for a further 1- 2 mins, until smooth and thickened, be careful not to overheat, add seasoning to taste. Remove from the heat and keep warm while you cook the scallops. Heat the oil and butter in a large heavy-based frying pan, add the pancetta a fry over a medium heat for 2-3 mins until begin to release some fat. When golden and crisp, remove with a slotted spoon to a plate. Then drain off the fat, add ½ tbsp olive oil and add the asparagus and fennel to the pan. Fry for 1-2 mins stirring occasionally. In a separate frying pan, heat ½ olive oil with a small knob of butter, when hot add the scallops and sear for 30 seconds-1 minute on each side depending on their size. Return the pancetta to the pan with the veg. 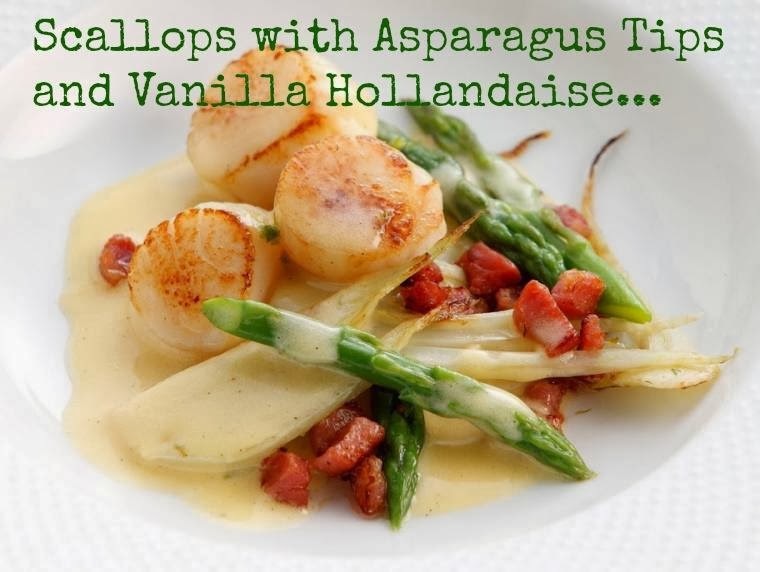 Divide this between 4 starter plates and serve with scallops on top with the vanilla hollandaise drizzled over. "Welcome To The Weekend Blog Hop 1st Birthday Edition…"
kay, that looks absolutely mouthwatering…. This looks yummy, must try! Thanks for the recipe! Beautiful presentation of this delicious sounding dish. Looking at it, I am getting hungry, and I just ate!